The three Bobbin neighborhoods (Bobbin Brook, Bobbin Trace, and Bobbin Mill Woods) are enjoying brisk home sales this year. In fact, there have already been more closed home sales than in any of the past ten years, and the current pace of sales is consistent to the numbers posted at the peak of the housing market. 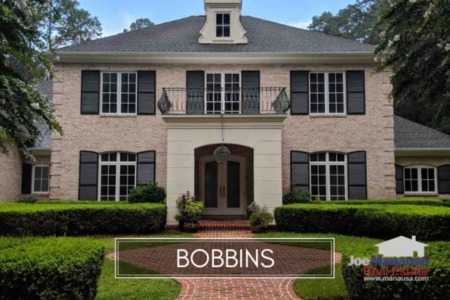 While many homes and neighborhood are doing better this year, this is newsworthy because the three Bobbin subdivisions represent some of the most expensive homes selling in Tallahassee. They have been the bedrock of our luuxury home market since the early 1990s. 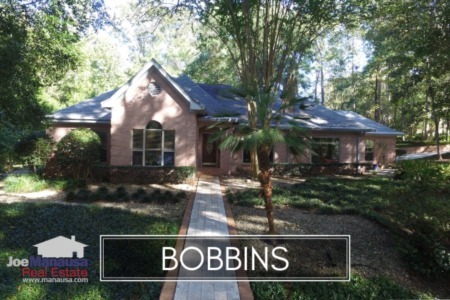 If you are seeking a luxury home in NE Leon County, then the 3 "Bobbins" (Bobbin Brook, Bobbin Trace, and Bobbin Mill Woods) should be on your list of the finest homes in our area. Located (on the south side of Maclay Road about a half mile North of the Interstate), these homes offer healthy portions of both house and land. So take a look at this updated report, featuring average home price trends, average home value trends, and average home size trends in the three Bobbin neighborhoods. Additionally, all current listings in the Tallahassee MLS and all closed home sales going back to 1991 are included for this popular NE Tallahassee neighborhood. It is important to note that the narrative contained below is for sales through December for all previous years, but through the first week of September in 2015. The graphs and the closed sales table will be continuously updated into the future (meaning bookmark this page if you always want to know the current status of homes in Bobbin Brook, Bobbin Trace, and Bobbin Mills Woods). Average home prices move around a lot in these three subdivisions, mostly due to the relatively few number of homes selling each year. When a "big one" sells for over $1M, it quickly brings the average way up, and conversely, when most the the typical homes here sell, the averages return towards a more realistic level of the Tallahassee real estate market. Overall, average home prices in the Bobbin neighborhoods appear to be recovering in 2015. The average recorded sales price through early September has been $640,950 for Bobbin Brook, Bobbin Trace, and Bobbin Mills Woods, and already 12 homes have sold. The pace of home sales is very good right now. In fact, if the 5 homes on the market now close by year's end, it will be the third best year on record for home sales in the Bobbin neighborhoods. Low interest rates have made these homes affordable and that is why sales are strong right now. Average home values in the Bobbins are hard to measure due to the low liquidity of high end home sales. We looked up the previous home sales from this year's current sales (meaning the current sellers closed as buyers) and can tell you a few interesting things about Bobbin homeowners. So plenty of high end inventory combined with a large housing market correction have greatly impacted the appreciation of Tallahassee's largest homes. Additionally, many of today's luxury homebuyers are choosing to build new construction, so even as the rest of the market is recovering, the inventory of luxury homes is stagnant or possibly even growing. Thus far in 2015, the average value of a home sold in the Bobbins has been $164 per square foot ($176 psft in 2014). The average home size sold in the Bobbins typically falls in a range of 3,500 to 5,000 square feet, and 2015 seems to be falling right in the center of this range. The 12 Bobbin neighborhood home sales in 2015 have averaged 4,099 square feet. The following list of homes are the most recent listings in Bobbin Brook, Bobbin Trace, and Bobbin Mills Woods. The following list shows home sales going back to 1991 in the Bobbins. I hope you enjoyed our September 2015 update on home sales in Bobbin Brook, Bobbin Trace, and Bobbin Mills Woods, please feel free to drop me a note if you have questions not covered in this report.